Experience the Let's YO Brand! Irresistible delectable yogurt is just one component of the Let's YO yogurt experience. The Let's YO brand has been carefully developed to appeal to health conscious and trend-forward customers with active lifestyles. The hip, energetic and socially connected store environment adds yet another dimension to Let's YO's distinctiveness among traditional yogurt stores. We're developing a strong brand loyalty among our growing guest base through interactive marketing programs and social media outreach. Along with our delicious frozen yogurt and fresh toppings, we offer the finest premium breakfast cereals and granola, and fresh ground coffee creations brewed by the cup. Let's YO has the perfect treat experience for every age and desire. Franchise Support From Day One! We are committed to identifying the best opportunity for you in your area of development. With your partnership we will continue our strategy for expansion and to build the Let's YO franchise brand! Our experienced Construction Team has experience in working with all types of Real Estate from Free Standing, to Strip Centers, to renovated buildings. Your Project Manager will provide you with Let's YO approved floor plan, cost estimate, scope of work, and your equipment list. Let's YO Construction Team is here to ensure this process runs smoothly and efficiently while adhering to the Let's YO Franchise System standards. At our training facility franchisees and managers learn how to successfully operate a Let's YO store. The training is an intensive series of onsite workshops, online courses and hands-on training. Working from a solid brand and sales growth strategy, our team of marketing veterans will develop and manage all system wide tactics as well as assist you with specific ways to promote your store locally. The Let's YO operations team includes a number of professionals with wide-ranging food service expertise who function as your business consultant. These experts can assist with everything from sharing best practices, hitting P&L goals, engaging your team members, customer service, human resources, understanding trade areas and local store marketing. Through every aspect of the exciting but challenging opening process, the Let's YO team will assure that your store's opening is truly grand. Its time to join a real growth opportunity! Let's YO is quickly establishing itself as one of fastest growing new franchise brands in the Fro-Yo industry and has a plan for success that includes expanding this hot new brand nationwide! The simple operation of this rapidly growing product category and relatively low investment, allows you to be an investor inside your store, not an operator. With territories now open for expansion throughout the U.S. the timing has never been better to invest in a Let's YO yogurt franchise! The hippest brand in Fro-Yo can be yours! There's never been a better time to own a Let's YO franchise. This cool new brand is on the move and you can be a part of the excitement too! Single and Multi-unit territories are now available throughout the U.S. Start your franchise application today! 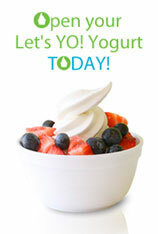 Click on Request Information for FREE info on how to open a Lets Yo Yogurt franchise today! Please Note: This Let's Yo Yogurt franchise opportunity and other franchise business opportunities, businesses and franchises for sale on this web site are not to be considered as an "offering", "franchise offering", suggestion or recommendation by Franchise Leader™. This advertisement depends entirely on the truthfulness of the information provided by our advertisers which includes, but is not limited to, franchisers, franchise brokers, franchise consultants and business brokers. Franchise Leader™ recommends that you consult a lawyer, financial consultant, accountant or professional advisor before buying a franchise or business opportunity or any type of business. By using this form or any part of our website, you have agreed to all terms and conditions of Franchise Leader™. Please review our Terms & Conditions for more information.